The 2014 Valentine's Day is coming. What gift have you prepared for your girlfriend or boyfriend? If you are bothered on how to pick up a Valentine's Day gift, why not make a romantic movie for her/him to show your love? Many classic romantic movies are unforgettable and the classic scenes have been enjoyed for years. It is a good idea to extract the impressing scenes from romantic movies and make a new DIY movie. Here we pick up some classic romantic movies. The fantastic romantic world of Jane Austen again makes its way to the silver screen in Joe Wright's new adaptation of the classic novel Pride and Prejudice. This adaptation is, for lack of a better word, a Brilliant achievement that keeps you actively involved from the first scene to the very last scene, just about consuming you with aching romance – and it is sprinkled with humour and intelligence. Sparks fly when spirited Elizabeth Bennet meets single, rich, and proud Mr. Darcy. But Mr. Darcy reluctantly finds himself falling in love with a woman beneath his class. The couple overcame their own pride and prejudice and finally went together. What impressed me in the movie is that Elizabeth's father told her that he thought no one could deserve his daughter. Sleepless in Seattle features Tom Hanks and Meg Ryan as Sam Baldwin and Allie Reed who, against all odds, meet and fall in love with the help of Sam’s son, Jonah. Tom Hanks stars as widower and single father Sam. When Sam's son, Jonah, calls into a talk radio program looking for a new mother, Sam ends up getting on the phone and laments about his lost love. Thousands of miles away, Annie (Meg Ryan) hears the program and immediately falls in love with Sam, despite the fact that she has never met him and that she is engaged to humdrum Walter (Bill Pullman). Believing they are meant to be together, Annie sets out for Seattle to meet Sam, who, meanwhile, contends with an onslaught of letters from available women equally touched by his phone call. Destiny ties the two people in love together. Casablanca is famous as a romance, but it’s really so many things at once. You’ve got the elements of a war film, a noir and a pulpy crime film all swirling around one of screendom’s best cases of natural chemistry between Humphrey Bogart and Ingrid Bergman. If you’ve never actually watched it, you may feel you already know everything there is to know about Casablanca, but it’s so much more than its quotable dialog and “As Time Goes By.” It grabs you and pulls you in immediately—nothing short of great popular entertainment. Many subsequent films have drawn on elements of Casablanca. Its unique story of a love triangle set against terribly high stakes in the war against a monster is sophisticated instead of outlandish, intriguing instead of garish. This is certainly among the most spirited and ennobling movies ever made. While not a classic romance film, Pixar’s WALL-E is a heartwarming tale of two robots that fall in love. In the distant future, Earth is covered in garbage and humans have abandoned the planet. WALL-E trash compacter robots are left behind to clean up the mess, and what follows is an unexpected and surprisingly relatable story. WALL-E isn't only the best film of 2008 so far and it is more than a love story. It is a pure masterpiece. From start to finish, the film wraps you in utterly delightful charm and humanity. At the British National Movie Awards, which is voted for by the public, it won Best Family Film. WALL-E was listed at #63 on Empire's online poll of the 100 greatest movie characters, conducted in 2008. In early 2010, TIME ranked WALL-E #1 in "Best Movies of the Decade". When we talk about love stories and romantic films, Roman Holiday cannot be ignored. Roman Holiday should appeal to everyone who loves a good romance, and this one is a great one. The rest of us will be well content with the splendor of Rome and the chance to see the remarkable Audrey Hepburn in her debut movie. In other words, Roman Holiday has something for every palate. In 1999, Roman Holiday was selected for preservation in the United States National Film Registry by the Library of Congress as being "culturally, historically, or aesthetically significant". This is the role that brought Audrey Hepburn an Oscar and made her a well-known star. It is the natural and ingenuous performance that makes her such a charming and unforgettable character, a graceful presence on the screen. How to Extract Romantic Scenes from DVDs? 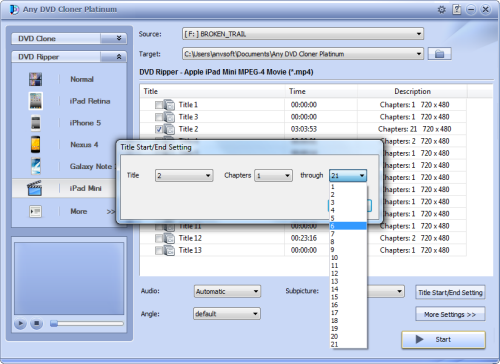 In order to extract chapters from the romantic movies, you need a DVD ripper tool. Any DVD Cloner Platinum works perfectly in converting DVDs to high definition videos. It also allows you to convert a specified part. You can download the evaluation version and follow the below instructions to give it a shot. Step 1: Insert the DVD to your DVD drive and then run Any DVD Cloner Platinum. Step 2: Unfold "DVD Ripper" tag and choose one in the output profile. Step 3: Click "Title Start/End Setting" and select the chapter you need and then click OK to confirm. Step 4: Hit "Start" button to start conversion. All of the movies can be ripped successfully with Any DVD Cloner Platinum in a few minutes. You can merge all the impressing moments togehter and show the DIY movie to your girlfriend or boyfriend as the Valentine's Day gift.